Lehava, Yad Leachim to join hundreds of protesters in demonstration against Christian conversions this Shabbat. 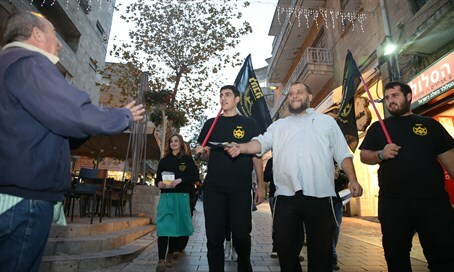 Hundreds of activists from the anti-assimilation groups Lehava and Yad L'achim will join Rishon Leziyon residents for a mass protest against a Christian missionary event this Shabbat. On Saturday morning they will hold shacharit prayers in front of the municipal hall where the in which the missionaries are conducting a conversion ceremony. Rishon Leziyon Mayor Dov Zur has opposed the ceremony, but a court ordered the municipality to allow it to take place in a culture hall. Bentzi Gopstein, the head of Lehava, said that "the organization will join other good Jews and organizations to prevent the shame. When the time comes for God to ask us if we tried to prevent our brothers from converting, we will say that we did all we could and we did not allow Shabbat to tie our hands."